2016 was a busy year for the US Marine Corps. The service kept pretty active in training and in combat: Marine pilots have been, and continue to hammer ISIS fighters in Iraq and Syria, while Marine advisers operate on the ground in Iraq. Meanwhile, the Corps started rotating troops to Australia and carried out other large training exercises around the world. Of course, there was much more that happened, and usually, a Marine Corps combat photographer was on hand to document the action. We went through the Corps' Flickr photos and picked out our favorites for the past year. Cpl. 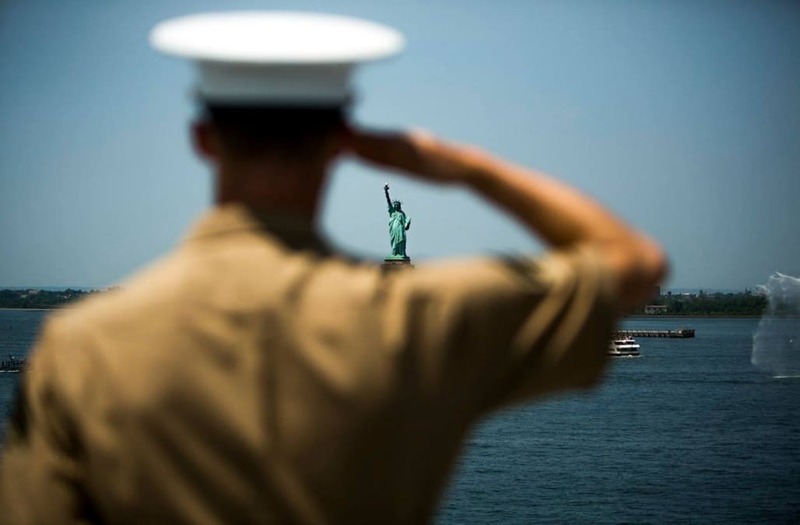 Seth Hall, anti-tank missileman, 3rd Battalion, 6th Marine Regiment, mans the rails of USS Bataan in a parade of ships as part of Fleet Week in New York, May 25, 2016. The USS Bataan transported more than 500 Marines and sailors with the 24th Marine Expeditionary Unit who will participate in this year’s Fleet Week. ... to the mountaintops of Australia, where Marines started deploying to back in April. A UH-1Y Huey helicopter lands on top of Mount Wollondain to retrieve a group of Marines in Bradshaw Field Training Area, Northern Territory, Australia August 13, 2016 in support of Exercise Koolendong 16. The aircraft is with Marine Light Attack Helicopter Squadron-367 (HMLA 367 "Scarface"), based out of Marine Corps Base Hawaii. U.S. Marine Corps Cpl. Kyle Hancock, a fire team leader with Company C, Marine Wing Support Squadron 373, Special Purpose Marine Air Ground Task Force - Crisis Response - Central Command 16.2, fires an M249 light machine gun during a familiarization range at an undisclosed location in Southwest Asia, June 8, 2016. SPMAGTF-CR-CC is forward deployed in several host nations, with the ability to respond to a variety of contingencies rapidly and effectively. U.S. Marines with the 7th Engineer Support Battalion, 1st Marine Logistics Group, go through mock breachings as part of group training. The training includes working with simulated explosives as well as breaching doors and windows at Camp Pendleton, California, May 25, 2016. ... or Marine pilots letting loose flares over North Carolina. Four EA-6B Prowlers belonging to each Prowler squadron aboard Marine Corps Air Station Cherry Point conducted a "Final Four" division flight aboard the air station March 1, 2016. The "Final Four" flight is the last time the Prowler squadrons will be flying together before the official retirement of Marine Tactical Electronic Warfare Training Squadron 1 at the end of Fiscal Year 16 and the eventual transition to "MAGTF EW". MAGTF EW is a more distributed strategy where every platform contributes to the EW mission, enabling relevant tactical information to move throughout the electromagnetic spectrum and across the battlefield faster than ever before. Of course, not every day of the last year was all action-packed for the Marine Corps. Lance Cpl. Jozay Gonzalez provides security for his team as they cross a danger area Jan. 7, 2016, on Camp Hansen in Okinawa, Japan, during a three-day field training exercise. Marines with Alpha Company, Battalion Landing Team 1st Battalion, 5th Marines, 31st Marine Expeditionary Unit, conducted patrol training in which they had to locate and attack another platoon in their company. Gonzalez, a fire team leader with Alpha Co., BLT 1/5, 31st MEU, is a native of Sutter, California. A U.S. Marine Corps AV-8B Harrier assigned to Marine Attack Squadron (VMA) 223, conducts an aerial refuel near Marine Corps Air Station Cherry Point, North Carolina, Nov. 15, 2016. Marine Aerial Refueler Transport Squadron 252 participated in an aerial refueling exercise with VMA-223, Marine Tactical Electronic Warfare Squadron 3, and Marine Medium Tiltrotor Squadron 365 to maintain interservice operability. Staff Sgt. Tim Chambers (Ret.) holds a salute for his 15th Rolling Thunder in Washington D.C. with his bride, Lorraine Chambers, May 29, 2016. This year Chambers married Lorraine in the same spot where he renders his 4-hour salute. ... and enjoy a good show. The Wall of Fire is an eye catching display at the 2016 MCAS Cherry Point Air Show celebrating 75 Years, on Marine Corps Air Station Cherry Point, N.C., April 29, 2016. This year's air show celebrated MCAS Cherry Point and 2nd Marine Aircraft Wingâs 75th anniversary and featured 40 static displays, 17 aerial performers, as well as a concert. Aircraft Rescue and Firefighting Specialists with Marine Wing Support Squadron 473 and MWSS-374 hone their skills in a simulated car-fire scenario on board Marine Ground Air Combat Center Twentynine Palms, California, June 23, 2016. This exercise is one of many scenarios Aircraft Rescue and Firefighting Marines use to remain proficient. ... documenting the sometimes-very-dirty life of a Marine.